Asteroid 2 Pallas reaches opposition this month. 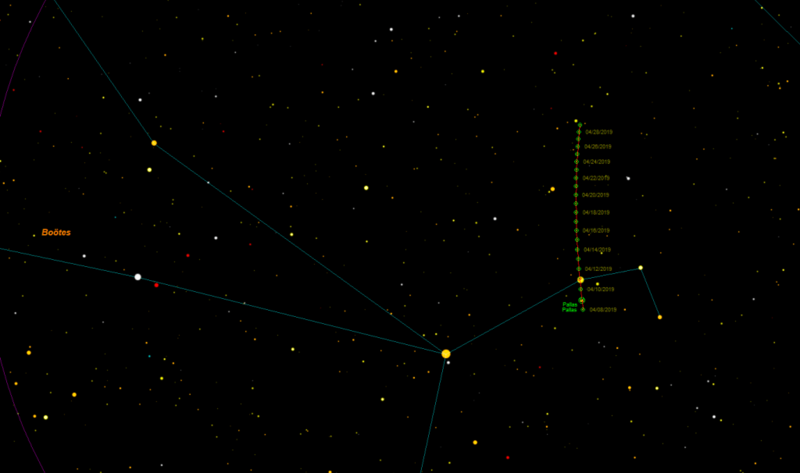 The brightest Pallas reaches is magnitude +7.9, so it is well below naked eye visibility. It will require binoculars or a telescope to view it as a star-like point moving through the southern part of Boötes, the Herdsman. Pallas has an orbital period of 4.62 years and lies almost 3 astronomical units from The Sun. On the 11th of April, at around 01:00 BST Pallas will be very close, approximately 4 arc minutes northeast, of the bright naked eye +2.7 magnitude star, Muphrid (Eta Boötis). This will make the asteroid much easier to find. The map below shows the path of the asteroid for the rest of April.